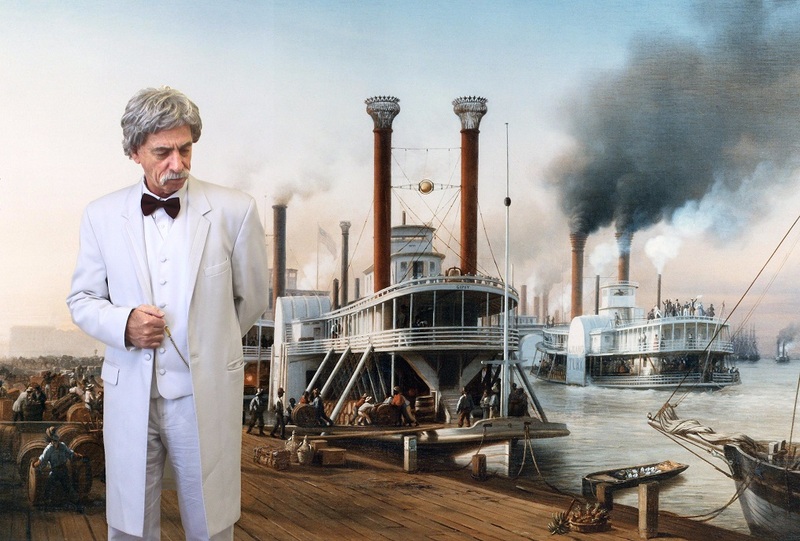 Below are digital composites Dave Thomson made of Jim Waddell (Hannibal Missouri's actor portraying Mark Twain at the Mark Twain Museum and Mark Twain Cave) superimposed over historic photographs of steamboats, a painting of steamboats by Hippolyte Sebron at New Orleans n 1850 and a color serigraph by Robert Addison of a derelict, sunken steamboat called the WESTERN WORLD. Jim Waddell is a gifted actor with an amazing memory and he has memorized many entertaining passages from the writings of Sam Clemens. The following video features Jim Waddell giving his own opinions on American politics as well as those of Sam Clemens. Filmed by Julian Simmonds and his crew from the UK on the banks of the Mississippi at Hannibal in 2007. I grew up in northeast Missouri in a small town on the banks of the Mississippi River. I live in Hannibal now. I've been performing professionally since 1971. In addition, I've owned a restaurant in the French Quarter of New Orleans, been Mayor of a small town in southern Missouri, owned an art dealership in Florida, worked as a printer, newspaper correspondent, magazine editor, and crewed on a steamboat. I've been involved in at least a thousand other enterprises and they've all been fraught with peculiarity. "I tend to be a purist in my delivery of Twain's material and prefer verbatim renditions to those that occur when a performer indulges in "artistic license." "The difference between the right word and the almost right word is the difference between lightening and the lightening bug," as the venerable one says. I have a passion for historical research and an aggregate of sixteen years at Silver Dollar City in Branson, MO, which supplied me with an intimate understanding of the 19th century lifestyle. 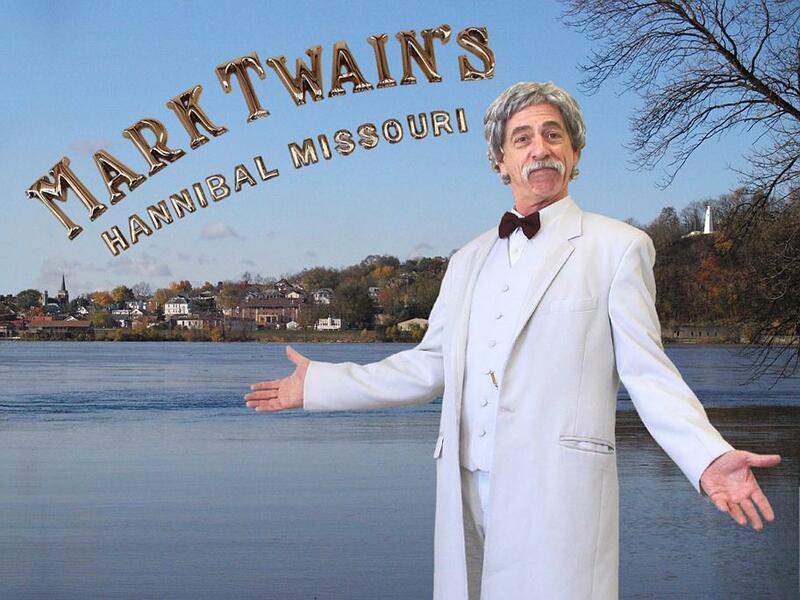 I perform regularly at the Mark Twain Boyhood Home & Museum and the Mark Twain Cave, both in Hannibal. 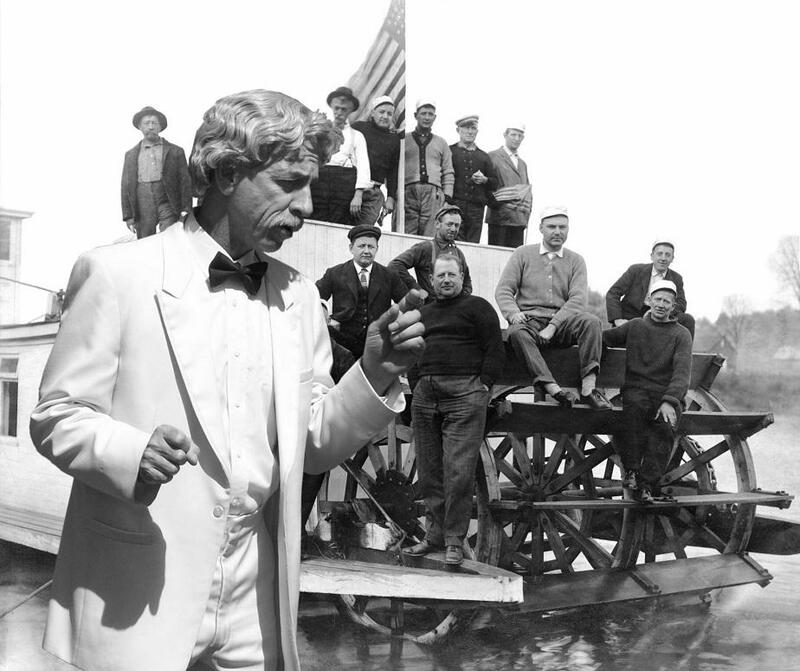 Actor Jim Waddell sits on the bank of the Mississippi and shares Mark Twain's classic observations on U.S. politics. Film produced by Julian Simmonds of The Telegraph. 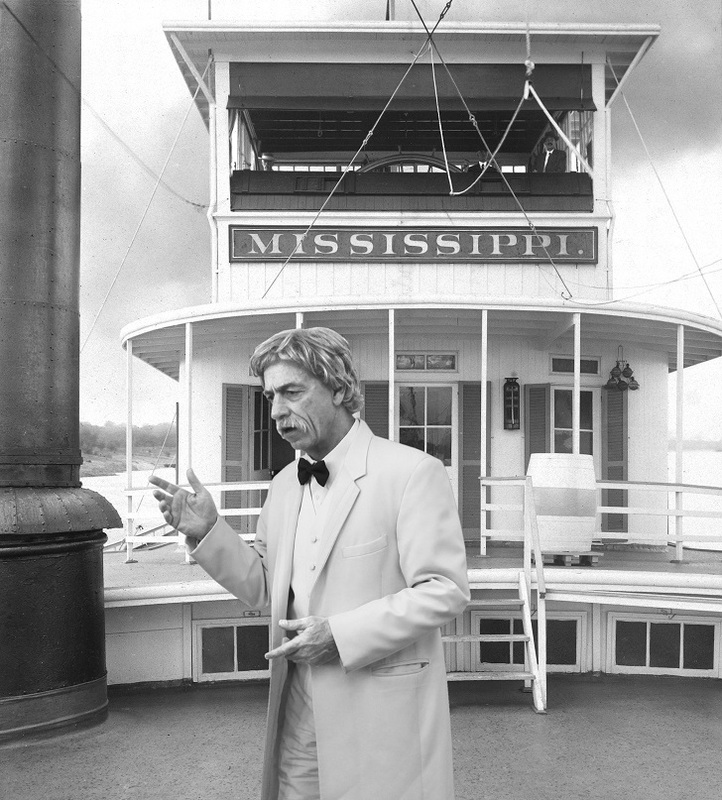 Jim Waddell as Mark Twain in 2009 in a photo by Steve Chou in Hannibal, teleported in Photoshop back to Vicksburg in 1968 when the mighty towboat SPRAGUE still floated there. 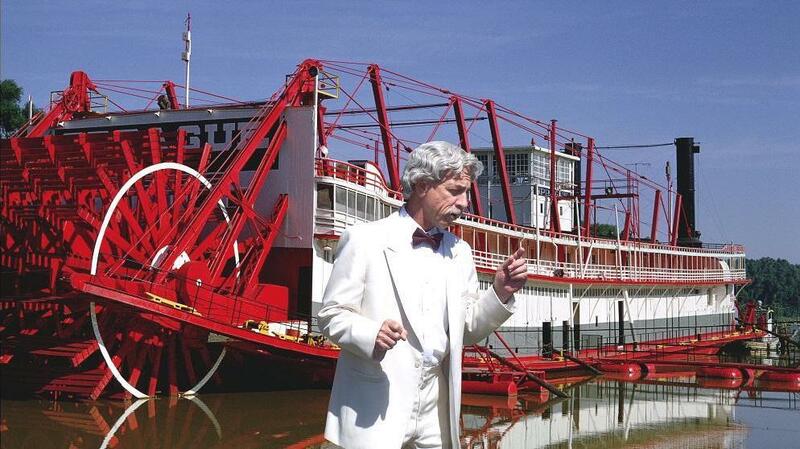 The Sprague, the largest steam towboat ever built, was built by William Peter Sprague while he was in his 70s. He built it for the Monogahela River Consolidated Coal and Coke Co. The company was formed in October., 1899 when over 90 independent coal operators of Pittsburgh were consolidated, becoming the largest river operation of all time. 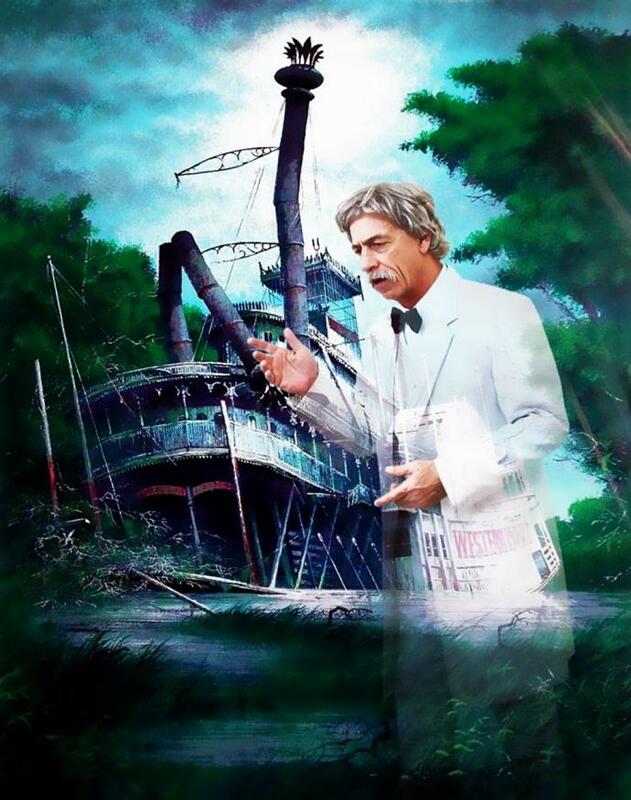 Composite of Jim Waddell double exposed over a 1973 serigraph print, by illustrator and painter ROBERT ADDISON, of the derelict steamboat WESTERN WORLD from Merrill Chase Galleries, with all accompanying paperwork. This is a signed, unnumbered trial proof, from the artists' collection, with image area of 20 x 26 inches. "Dammit!! You do realize I will now have to upgrade my performance in an attempt to satisfy the promise of quality that is so obviously inherent in this art work. I'm not used to standards of that altitude." SW p wh b. Elizabethtown, Pa., 1848. 338 tons. 180 x 35 x 7.8. Engines, 25 'A's- 8 ft.
Four boilers, each 40" by 28 ft., two 15" flues. Built for Capt. Alex Norton, Steubenville, Oh., who commanded. Ran Pittsburgh-New Orleans. Came in collision with H.W.R. HILL (see) just above Princeton, Miss., Dec. 14, 1852. The WESTERN WORLD turned turtle with loss of 12 lives. Part of the wreck floated 15 miles. A lengthy lawsuit resulted, and Capt. Norton eventually collected $30,000 damages. It is said she had been lengthened at Cincinnati several years before her loss. Norton operated a boat store and commission business at New Orleans after the war. Jim standing where Teddy Roosevelt and John McIlhenny stood in a stereoview taken aboard the MISSISSIPPI in 1907. Jim transported into the pilot house of the snagboat HORATIO G. WRIGHT,built 1880 at Carondolet, MO by Western Iron Boat Co. for the U.S. Engineers.It was dismantled in 1941. "Phantom" Waddell/Clemens double exposed in the sky above the GORDON C. GREENE in June of 1942 approaching the TVA Wilson Dam in Alabama. Photo by Arthur Rothstein. I retrofitted the steamer with tall stacks and a larger pilot house to her more of a vintage look. Formerly the towboat ELIZA H.
The riverboat gamblers composite I created from three photos . 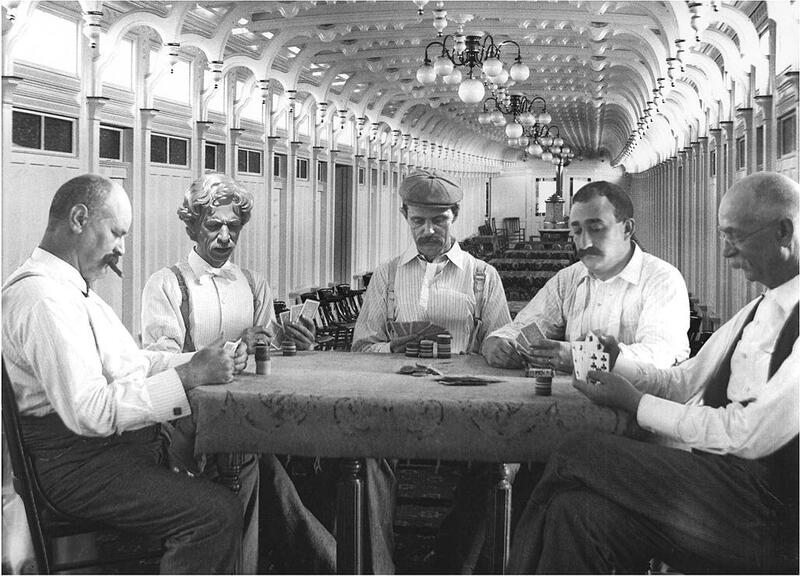 . . two vintage images: first, a group of five poker players, second the interior of what I believe was the cabin of the BELLE OF THE BENDS. I replaced the face of the second gambler on the left with Jim's face from a photo taken by Steve Chou. 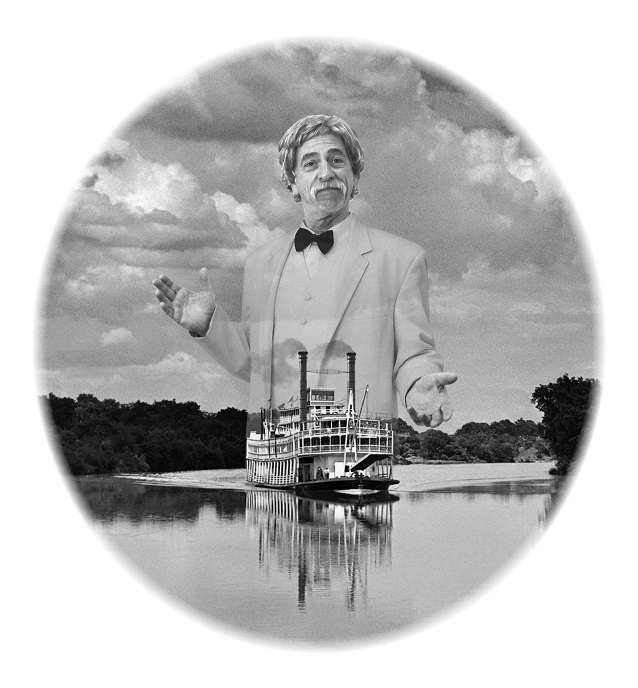 Jim Waddell superimposed over the St. Louis harbor boat MARK TWAIN which Sam Clemens dedicated in 1902. 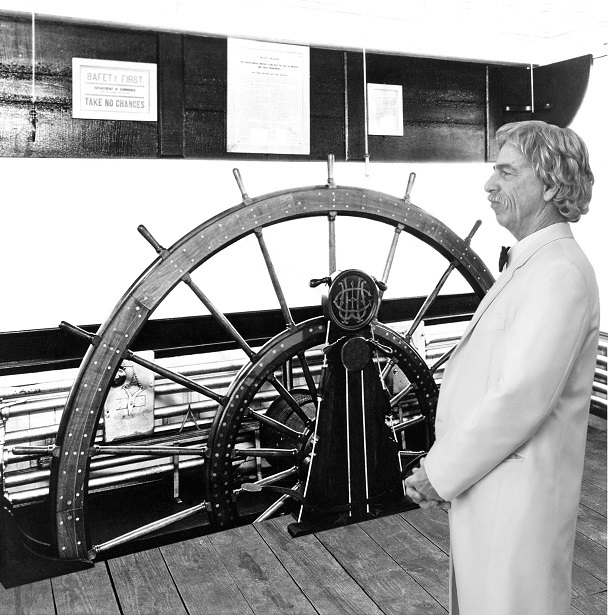 "In June 1902 Mark Twain/Samuel L. Clemens paid his final visit to the Mississippi River when he accepted an honorary degree at the University of Missouri in Columbia and helpeddedicate a St. Louis harbor steamboat that was named in his honor. 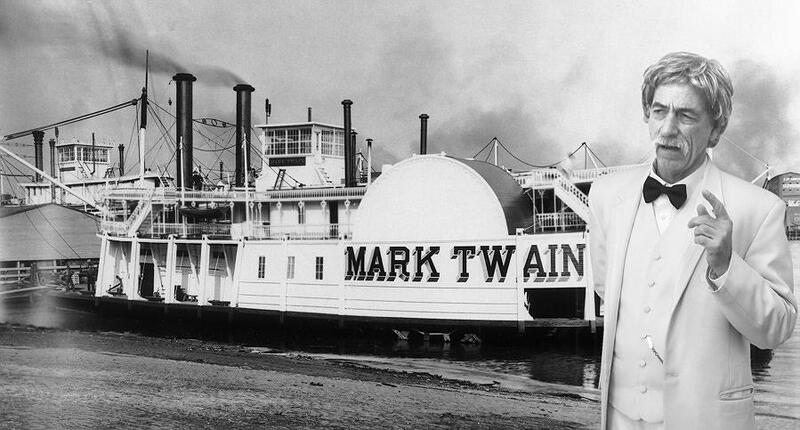 Originally named ELON G. SMITH when new in 1873, this boat was renamed CITY OF ST. LOUIS while a harbor boat there; then renamed once more, this time MARK TWAIN in 1902 to celebrate what turned out to be the last visit Sam Clemens would make to the state of Missouri and the Mississippi River. In 1907 the MARK TWAIN was replaced by the ERASTUS WELLS." The photo of Jim in the composite was by Georgia Degitz and the steamboat background is a detail from the mirror image of Hippoytle Sebron's painting of "Giant Steamboats at New Orleans" circa 1850. The painting belongs to Tulane University in New Orleans. I took the background photo of Hannibal, MO from the Illinois shore looking southwest about 5 years ago. On the left is one of the church spires on the far right on top of "Cardiff Hill" stands the "Mark Twain Memorial Lighthouse." The photo of Jim was one of a dozen or so that local Hannibal photographer Georgia Degitz took upstairs in the Mark Twain Museum to provide some good likenesses of Waddell that were utilized in the composites on this page. The lettering floating in the sky is from an old license plate "Topper" that I had chrome plated. After photographing the "Topper" outdoors on the patio under the stripe'ed awning I opened the file on the computer and cut out the lettering in Photoshop then rotated it all to fit in the sky upper left. Jim in the foreground and behind him the little sternwheeler "D.W." which was apparentlya recreational pleasure boat of a gentleman's club (members posing around and above paddlewheel)from which they could escape their wives on weekends to fish, hunt or or swim.It is not known where the boat's home port was, perhaps the locale was along the Ohio River. This was a complicated composite . . . Georgia Degitz took the photo of Jim in a modern style chair. 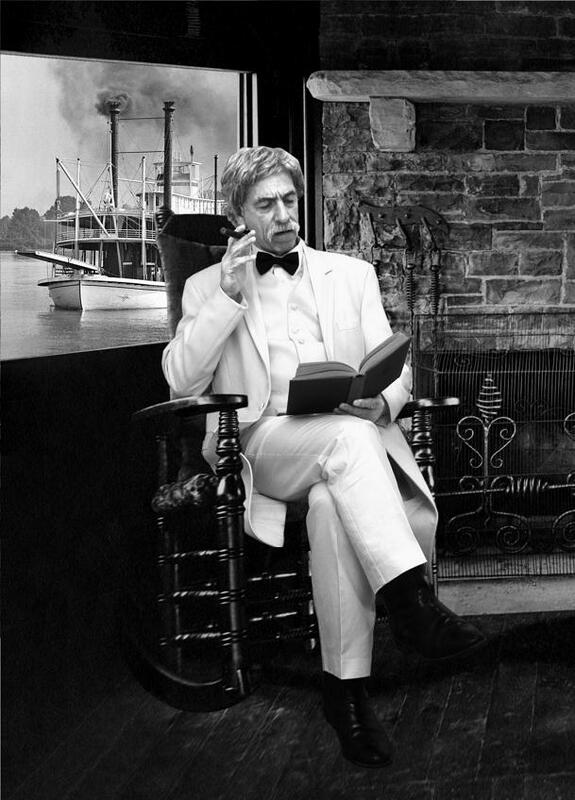 In Photoshop I put Jim into one of Mark Twain's own rocking chairs in the octagonal study that was built for him by his sister in law Susan Crane in 1874 on her Elmira, New York estate called "Quarry Farm" where the Clemens family spent their summers. The window sill, flooring and hearth are all in that study where Sam Clemens wrote (among other works) portions of ADVENTURES OF TOM SAWYER & HUCK FINN as well as LIFE ON THE MISSISSIPPI. The study overlooked the Chemung River valley and Clemens dearly loved his little sanctuary where he could work in blissful solitude away from his sometimes distracting family. His daughters Susy, Clara and Jean were told to not disturb "Papa" while he was working but they discovered that if they were holding a kitten or cat in their arms when they entered the study that Sam would drop everything to play with the cat and visit with the girls. I replaced the foliage outside the window with a Murphy photo of the steamboat CITY OF SAVANNAH (1902-1911) that evokes a "daydream" that Waddell as Clemens has conjured up from memory and the book that he's reading. The photo of the study was taken in 1903 when Clemens revisited the place to pose for photographs. 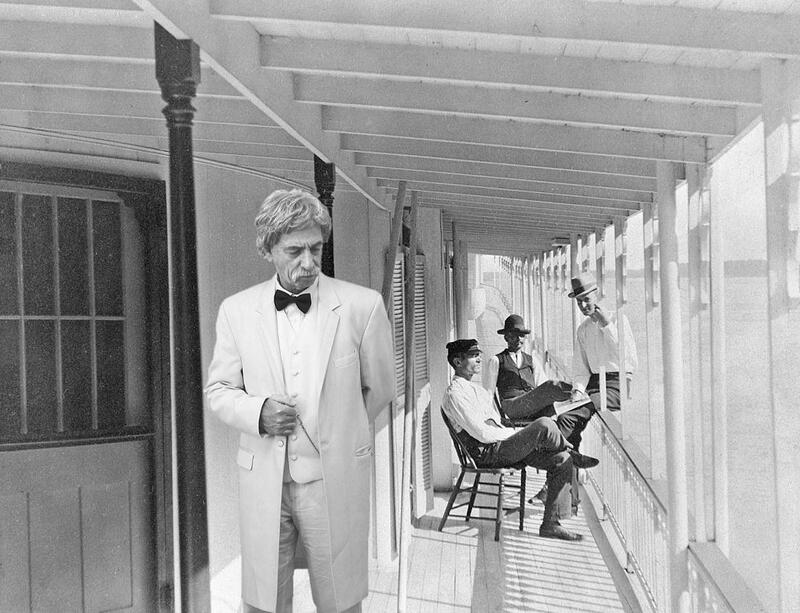 Have added Jim Waddell as Mark Twain to this evocative photo from the LaCrosse steamboat collection of three crewmen on the deck of the steamboat J.G. PARKE. Original price, $18,750. Home port or owner's residence circa 1882, Rock Island, Illinois. 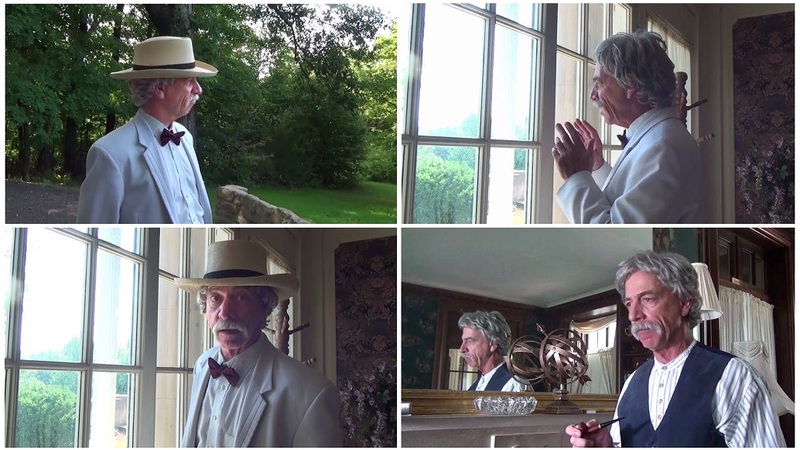 Four frame captures from a short 3D film with Jim Waddell as Twain talking about inventor Nikola Tesla. I didn't realize that Tesla's last name was pronounced "Tezla" as Jim says it. The film had its debut at Hannibal's first Steampunk Festival on a weekend in September of 2014. Available in both 2D & 3D versions on YouTube. If you got a pair of red & blue 3D glasses you can watch Jim as Twain talking about Tesla and also a film in both formats about the Steampunk Fest by Frank Elmore. Jim Waddell portrays MARK TWAIN as he recalls his encounters with the mysterious genius NIKOLA TESLA. Written by Jim and Directed by FRANK ELMORE for 2D and 3D presentations. The Video was produced in cooperation with the Hannibal History Museum.